Time for Monday’s Music Moves Me and also time for our next Battle of the Bands! The theme for today is ‘Songs about Cars or Trucks’. We had a similar theme back in May of this year, so I knew I needed to come up with something different. 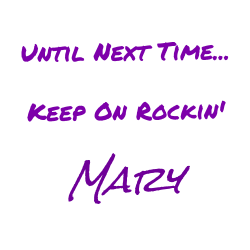 Additionally, it is now Rocktober, so I wanted to pick a song that has a bit of pep in it’s step. "Mercury Blues" is a song written by K. C. Douglas and Robert Geddins, and first recorded by Douglas in 1948. The song, originally titled "Mercury Boogie," pays homage to the American automobile, which ended production in 2010. Rights to the song were purchased by the Ford Motor Company (who already owned the Mercury marque). Ford, in turn, used it for a television commercial featuring Alan Jackson singing his version of the song with the word "Mercury" replaced by the words "Ford Truck." The song has been covered by quite a few different artists. Way back in 2014, our fearless leader of the Battle of the Bands Blog Hop, Stephen, used this song in one of his battles. For his battle he placed David Linley against Steve Miller Band. David Linley etched out Steve Miller Band by one vote. Today, I’ve got two different contenders for you to choose from. 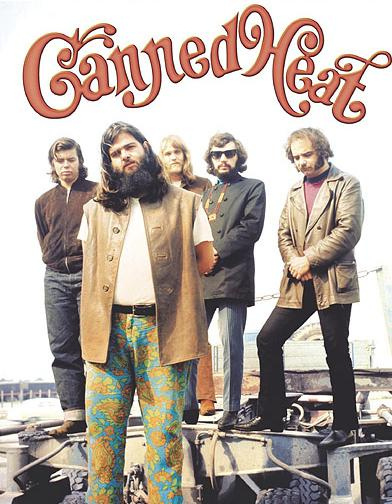 Canned Heat is an American rock band formed in Los Angeles in 1965. The group has been noted for its interpretations of blues material and for its efforts to promote interest in this type of music and its original artists. It was launched by two blues enthusiasts, Alan Wilson and Bob Hite, who took the name from Tommy Johnson's 1928 "Canned Heat Blues", a song about an alcoholic who had desperately turned to drinking Sterno, generically called "canned heat", After appearances at the Monterey and Woodstock festivals at the end of the 1960s, the band acquired worldwide fame with a lineup consisting of Hite, Wilson, Henry Vestine and later Harvey Mandel, Larry Taylor, and Adolfo de la Parra. Michael Lee Aday, better known by his stage name Meat Loaf, is an American musician, singer, songwriter, record producer, and actor. 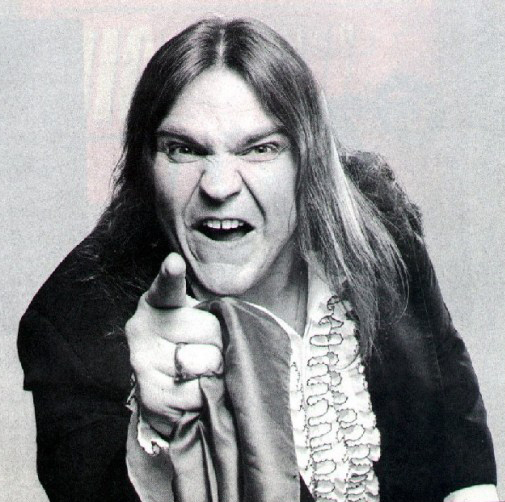 Meat Loaf's Bat Out of Hell trilogy of albums has sold more than 50 million copies worldwide. Almost 40 years after its release, it still sells an estimated 200,000 copies annually, and stayed on the charts for over nine years, making it one of the best selling albums in history. He is also known for his powerful wide-ranging operatic voice and theatrical live performances. This song is hidden on the album “Couldn't Have Said it Better”. After the song "Forever Young" ends you have to let the CD keep playing about two more minutes, then "Mercury Blues" starts with the sound of a Mercury starting. Well worth the wait! 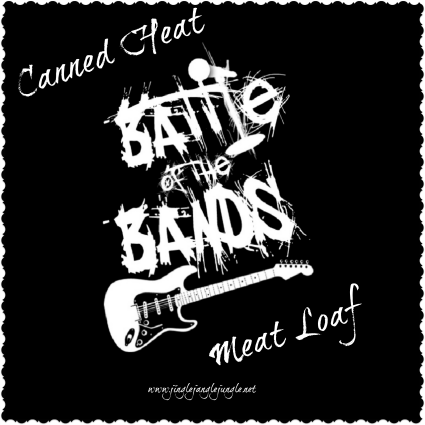 Please vote for either Canned Heat or Meat Loaf in the comments. Voting will end on October 22, 2017 at 6pm EST with results being posted on October 23. I’d like to encourage you to visit the other bloggers participating in the battle of the bands as well. You can find a current list HERE, or on Stephen’s blog (you can also request to join the battle of the bands blog hop on his blog). ** It appears I have my dates and themes mixed up again. I swear when I last looked there was a theme assigned to today, and next week listed as freebie. Turns out I have my dates mixed up. Oh well.. I'm not about to re-write my post :) Enjoy it for what it is. *** I had to turn off the ability for Anonymous comments. I've been getting too much spam lately. Meat Loaf even though I always thought his name was one of the dumber names ever picked by a rocker. haha! Yeah, his name is a bit corny. One would think he'd change it to something better. Thanks for stopping by, and I've got that vote counted. Meat Loaf got the name because it's what his high school coach always called him because he was chunky. It's not proper Meatloaf without a bit of ketchup. My day is way behind schedule and to top it off I was having internet issues. I hope to make the rounds for MMMM before end of day, if not tomorrow. No worries, you know where to find me when ever it works in your schedule. :) Have a tunetastic week! I am a big Meat Loaf fan, so he gets my vote. Another vote for Meat Loaf. Thanks for playing! I'd been wondering where your Battle was. I was starting to think maybe you were skipping it this round, which would be a first for you, I believe. Hokey-Smoke! This was a tough, Tough, TOUGH contest for me to decide on. The hardest Battle for me in this round of BOTB. Well, obviously, I love the song, since it was one of the earliest I ever used in BOTB. I've never really cared much for Meat Loaf, so I thought this would be a slam-dunk for The Heat. But Meat Boy did this song really well, and I dig all the piano. I liked that loose, jamming feel of their version, although I could almost as easily have voted for The Loaf. A really great Battle, Mary! It's been a month of hell for me, and only destined to get worse before it get's better. I thought I would kill 2 birdies with one stone with this post. I'm glad that I looked up your older battle to see the results. This one is certainly going to be interesting. First vote for Canned Heat! Now we're cookin'! Easy choice for me: Canned Heat. Like Stephen says, I like the feel. Another vote for Canned Heat. Things are heating up! Either version is darn good, but there is an authenticity to the Canned Heat version. Meat Loaf delivers a slick studio show piece and there's nothing wrong with his sound. But for me it's gotta be Canned Heat with that driving bass and swamp boogie sound. A vote for Canned Heat. And just like that, the boys are neck and neck. This is going to be a tight race. OMG I haven't listened to Meatloaf in forever & he use to be my most favorite in highschool. By the dashboard lights was totally worn out by me in my collection. Great selection here girlfriend you finally got me movin'!!! Thanks for the boogie & I have to say the, "Couldn't have said it better", I haven't heard that one in like forever. I almost forgot about that one! YOU ROCK!!! I'll put you down for a vote of Meat Loaf. Will be around sometime today or tomorrow. Lots to get done first, and am having spotty internet issues. I vote for Meat Loaf. I can't resist that voice and the piano opening. I do love a good piano, and Meat Loaf does a good one! Thanks for stoppin in. My vote is for canned heat. I just love to hear them. They have that feel. 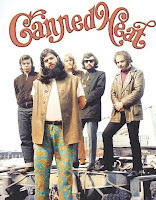 I've got your vote for Canned Heat counted. Well this sure is an excellent battle! At first while listening to Canned Heat I said "oh this is it, for sure". A. It really cooks! and B. I've never been a fan of Meat Loaf (such a stupid name!). But WOW, was I ever knocked back a bit. Meat Loaf really did one hell of a job with this song! And I was really pleasantly surprised. It didn't change my vote though. I'm still voting for Canned Heat. They just have some serious staying -power in my book and this song is one of the reasons why. They're classic, tight and talented. My vote goes to those Sterno boys! I'm really glad that you enjoyed this battle. I've had such an off-month. About to uproot my life AGAIN in the next few weeks. I'm getting too old for this mess. Going to keep blogging as much as I can, though. I have no idea where I'm going. I've got to get it figured out fast!. I am currently living with my cousin, but she is moving to Idaho (I'm not invited to go with) This is putting me in a real bind. Because I live where I work, I will also need to find a new job. My brother says I can come crash at his place once he gets done fighting with his wife about it, and I also have another option in a different part of Idaho (if I can sweet talk my brothers into helping me out financially the first few months) But I suspect I may be going to my brother's home for a few months until I can get it all worked out. I hate moving as much as the next guy. Thankfully, after this last purge, I don't have much to move. A third option would be living on the streets - but that doesn't sound very appealing, especially in the winter. This is such a close race. I can't wait to see the final outcome. Thanks for stopping by with your vote. I have to go with Meat Loaf. I adore the man; bought his autobiography. The piano really rocks in that version. I'm glad to have heard of Canned Heat, though. We do love the blues. Glad that you enjoyed the battle. It's turning out to be a pretty good one. When I saw your battle, I thought to myself, "I know McCarthy used this one already a LONG time ago, but NOT with these contenders." So, after listening I went straight-away to his comment. Sho nuff. He confirmed my memory on this was solid. Ironically, I think of Alan Jackson when I think of this song (and I've partaked in two battles with this song and no Alan Jackson to be found). Now that may not be a bad thing as I find this song repetitious and I got really tired of hearing AJ's version on the radio. I really like Meatloaf on this one. They get my vote! I thought about using AJ in the battle, but as it's ROCKtober, he wouldn't fit very well with the theme. These two though, are proving to be fairly worthy contenders. I did think about re-using Stephen's contenders but I do try to be somewhat different. Canned Heat needs to get their fire started, or they are going to get left in the dust! Thanks for stopping by, got your vote for Meat Loaf counted. This has been a really fun battle for me. I can't wait to share the results on Monday. Thanks for stopping by to cast your vote.